Richard will cover the cost of the lenders appraisal for all Divorce Angel referrals. Richard is a dedicated mortgage professional that puts his clients at the center of every conversation. He is passionate about providing an exceptional mortgage service experience, with timely responses and unique recommendations that meet his clients' specific financial needs. 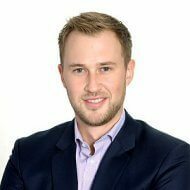 He graduated with a degree in Economics from McMaster University and started his career in banking in 2011 where he acquired numerous accreditations, licenses, and promotions. Throughout his 6+ years of experience he developed a very strong knowledge of mortgage financing and an extensive network of professionals in the industry. Richard won Scotia Bank's prestigious 'Best of the Best' award for overall performance on 3 separate occasions as Senior Financial Advisor. Richard left the bank to provide his clients with a wider variety of mortgage options and lenders, and now has access to over 50 lenders in Canada, including traditional bank mortgages. Whether you are looking to purchase a home, refinance, consolidate debts, or renew your mortgage, Richard will guide you in making the smart financial decision that works best for you. Since Richard's business is built primarily through referrals from satisfied customers, your positive mortgage experience is essential. With extensive background in banking, financial planning and mortgage financing, Richard has advised hundreds of clients going through unique separations and divorce. His careful approach to the sensitive nature of the separation process is appreciated, as Richard recognizes how divorce can lead to heightened emotions. Richard is an excellent and impartial source of divorce advice, and is a firm believer that informed mortgage decisions are always better than rushed ones. As a mobile mortgage broker that works around your schedule, Richard is absolutely dedicated to a next level Mortgage Experience. Richard’s number one priority is to save you money on interest rates, as he works for you and not the bank.